It’s been awhile since I reviewed a food book – awhile since I read a food book. I think that it’s almost like the feeling you get when you watch the news a lot, and you realize that the bad news is just a little bit too much. 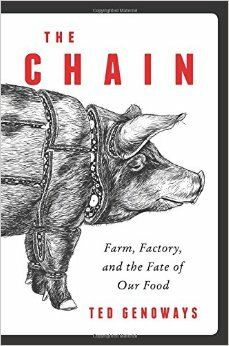 But when I saw many people in the food world talking about Ted Genoways’ The Chain: Farm, Factory and the Fate of our Food online, I thought it was time to get back in the game. I’m disappointed that books like this even exist for me to read, but I am glad I picked this one up and am putting my toe back in the water. It’s not a good habit to just turn my face to truth because it’s too hard to handle. Book after book and essay after essay have been written on the problems with factory farms, detailing their detrimental impact on the environment, animal welfare, public health and food safety. But The Chain is different by primarily focusing on the meat packing that happens at the two plants and tracing the problems backwards. Because all large meat companies, such as Hormel and Smithfield, are now vertically integrated, they produce their own grain, to feed their own pigs, and they slaughter, package, ship and sell them. One compelling section details the work of undercover workers in a factory pig farm that services the Hormel meat processing plants, there to investigate inhumane treatment of animals and violation of regulations (and basic decency). State legislatures are increasingly being asked by industry to pass legislation that outlaws this type of recording and whistle-blowing, collectively referred to as Ag-gag laws (For some background, this is not new. I wrote about this in April 2013). Ag-gag laws are just one of the ills that Genoways mentions – sections on water pollution and the fight of small towns to have their watersheds protected from contaminated manure lagoons as well as horrifically abused animals are both fascinating and horrifying. And the book is carefully and meticulously researched, with an extensive notes section and an index – one of the marks of good non-fiction. But the thing that sets The Chain apart is its focus on people. The people who work at the Hormel plants in Austin and Fremont and what it does to them and what it does to the surrounding communities. It is truly heartbreaking that we pollute clean water, abuse animals who are dependent on us for their care, and expose workers to horrific working conditions for near poverty wages – all for something like Spam. Spam, people. The section that detailed a mysterious illness that plagued workers at one particular plant actually made me sick to my stomach. Workers at a table that sucked out the pig’s brain matter with high pressure hoses had to work at such high speeds, that a cloud of brain matter always hovered over the table, because the matter never had a chance to settle before more was introduced. That’s right. A cloud of brain matter. Without proper safety equipment (that encumbered workers too much for them to keep up with the company-mandated line speed), workers inhaled the brain matter of the pigs daily for hours upon hours. It gave them nerve diseases that stripped their nerves of the sheaths that protect them, making it virtually impossible for them to stand or move without excruciating pain. The fight for workers’ compensation and for the company to acknowledge these abuses is sickening. Workers were permanently disabled with their quality of life forever diminished for something like $10/hour if they were lucky. On my worst day in my cubicle job, I can’t even begin to comprehend what working on the kill floor or the butchering line would be like at a meat processing plant. Why could Hormel (and other companies that have similar problems) get away with this? Having destroyed the unions that supported the workforce for decades, the companies rely on a workforce of primarily immigrant labor. No matter where you stand on the side of immigration reform or law, the situations created in these communities are no good for anyone involved. The workers and communities that are at odds against them are both under the same boot that’s pressing down on them – the corporate interests of companies who have free reign by government to do whatever they want, whenever they want, to whomever they want. I could go on for days. It was a great book. You should read it. What I can’t seem to shake after reading it is the feeling that we so easily take horrifying abuses and problems and distill them to numbers. Commodities. We think of pigs as “pork” and not as animals, with the ability to feel pain and excitement and care and attachment. X number of chops and roasts. That’s it. It would be easy to say that “only” X number of workers were affected by the nerve disease. But these aren’t just statistics. These are people. With faces and names and families. Hobbies and thoughts and dreams for a better life for their families – the same dream that all of us are working to reach. Does a human being, whether he/she has legal papers or not, deserve to inhale pig brain matter and suffer daily, agonizing pain, because the company increased the line speed so that we can eat more Spam than ever before? And so that Hormel can make increasingly more profit? Would the CEO of Hormel work at that same spot on the line, knowing what it’s done to people? I would venture to say no. Yet somehow, it’s okay to put someone else there. And leave them permanently disabled, physically and financially. Because that person isn’t a person. He’s a number. He’s a cog in a machine. When you buy a package of Spam, or some Hormel bacon, you help that cog in the machine keep spinning. The machine doesn’t stop until we do. Last week, a federal judge in California overturned the state’s ban on the sale of foie gras. If you aren’t a food person and/or you don’t have the kind of money where you can spend $50-$75 a pound on meat, you might not even really know what foie gras is. Well, it’s the liver of a duck or goose that has been specially fattened. Force-fed, actually. I don’t think that anyone can argue around the fact that most of the foie gras produced in this country is produced unethically. It definitely crosses the line into animal cruelty for animals to have tubes shoved down their throats to make them eat. There are places where foie gras is not produced in this way. Dan Barber, author of The Third Plate, talks about it in his book. In the instance he describes, the birds are cared for in a natural habitat and given the opportunity to eat whatever they want – however much they want – without being force-fed. Once they are fattened, they are killed by putting them to sleep first – painless for the birds. So there are some instances where the cruelty of force-feeding and painful slaughter isn’t involved (beyond the fact that the animals are ultimately killed for food, which does cross the line into cruelty for many people). However, whether or not someone should eat foie gras and whether or not its production is cruel is not what bothers me about this entire issue. Animal rights activists are livid and enraged about the lifting of this ban. So much so that chefs in California who are serving foie gras are receiving death threats. I think any sane human being can agree with me that death threats are not an appropriate response to this situation. But putting so much energy into this foie gras fight is a problem for me. Ducks and geese represent only the tiniest fraction of animals that are raised for food production in this country. Only a tiny percent of the thousands of restaurants in America are serving foie gras on their menus – and not every customer that eats in those restaurants is ordering it. We consume so little foie gras as a nation that it’s beyond absurd that the backlash to this issue is so strong. Guess what, America? We torture millions of animals every day in this country for food. Somehow it’s okay to be righteously angry at rich people for eating foie gras in a fancy restaurant because people see photos of these birds being force-fed and they are disgusted (and rightfully so). But many of the people who swear they would never eat foie gras are helping themselves to industrially raised chickens (meat and eggs) and cows (beef and dairy) and pigs (pork) every single day. Mark Bittman basically took the words right out of my mouth. There are no politicians who have the guts to come forward with legislation that protects these animals from cruelty. It’s easier to go after duck liver – something that most Americans won’t ever eat in their lifetimes anyway. We vilify a $75 slice of duck liver while we roll through the drive-thru for our $1 hamburger. There is no escaping or denying that industrially raised animals spend their lives in horrible pain, anguish and torture. I can find no excuse or justification for this. None. Requiring chickens to be raised cage-free or removing hogs from horrible gestation crates would help millions more animals than banning foie gras ever will. (Though that’s not to say that it’s enough.) But Americans love an easy target. To borrow a metaphor, we love to focus on the speck in someone’s eye instead of the gigantic branch sticking out of our own. I honestly think you have no right to protest foie gras if you consume any industrially raised animal products. You don’t have to be vegan to do that either – I am an omnivore by choice, but I would be vegan in a heartbeat if I didn’t have access to food from animals that are raised to my standards. “I don’t have enough money to eat ethically” is not an excuse to me. Is this a little preachy? Yes. Maybe a lot preachy. That’s fine. I do believe that people have the right to make their own choices about food. I don’t think people are villainous for eating CAFO beef or a McChicken sandwich. But do I believe the corporations who perpetuate this kind of treatment for animals in search of profit are villainous? Yes. Absolutely. We need to hold ourselves to higher ethical standards when it costs us something – some money, some inconvenience – not just when it costs a rich person in California his/her appetizer. As a nation, we are better off putting our energy where it counts – passing legislation that considers ALL livestock animals to be animals and not commodities, not just ducks and geese. 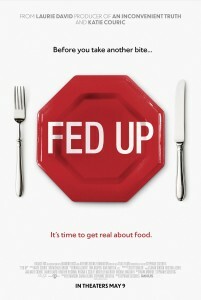 Fed Up came out in May of this year, and at the time, I kept meaning to see it in theaters, but I missed it. It came out on video in September (I still say video, like I could go rent a VHS at Hollywood Video or something), and I have been on the waiting list for it at the library for weeks. Finally, I was able to watch it this weekend with my mom. Going into it, my expectation was that it would be well done, but that I wouldn’t hear much that was new to me. I was pleasantly surprised – not just at what I learned, but also the fact that I’ve been mulling it over since I saw it several days ago. The basic premise is that what we’ve been taught for decades about the keys to a healthy lifestyle – eat less and move more – isn’t exactly right. And that the obesity epidemic is less “our fault” than we think it is. The film details the history of this epidemic and what factors have led to it, and how science no longer backs up the “all calories are created equal” mantra that Big Food likes to spew when the safety of their products is questioned. Type 2 diabetes cases are skyrocketing, particularly in children and adolescents, to the point where Type 2 is no longer called “adult onset diabetes.” We spend the GDP of a small nation on weight loss drugs and gym memberships, and every container of food in the supermarket has some health claim on it. Yet if America had a blood work panel done, it would show that by and large, as a nation we are pretty sick. Setting aside the idea of the “obesity epidemic” for a moment, let’s talk about what got us to this place. The filmmakers (as well as the World Health Organization and other esteemed health science groups) believe the primary culprit is sugar. When your body digests sugar, it needs fiber to slow down the absorption of the food. When something is high in sugar, but lacking in fiber, the body digests it quickly, overloading the liver and creating both fat and insulin. And that fast sugar digestion is what creates “sugar highs” and the related “crashes” once your body comes down off of the sugar. (They often liken sugar consumption to heroin or cocaine consumption, because it lights up the same parts of your brain.) It’s because of the way your body processes sugars that not all calories are created equal. 160 calories of almonds has a different effect on the body than 160 calories of soda. Beginning in the 1980s, America became obsessed with eliminating fat from our diets, and “low fat” became synonymous with health. But when an essential part of the processed foods trifecta (sugar, salt and fat) is removed, the others have to go up to make the food palatable. So those low fat products that we all were convinced by the food industry were healthy? FULL of added sugars. The American Heart Association recommends that adults only consume 6-9 grams of added sugar per day. Every teaspoon is 4 grams, so you really should be consuming only about 2 teaspoons per day of added sugar. The average American daily intake? 41 grams. And that’s AVERAGE. Sugar comes in many forms on nutrition labels – and it’s not just high fructose corn syrup that is the problem. The backlash against HFCS has actually become a good thing for the food industry – they take it out of their food, add back in a ton of sugar, and then sell it as a health food because it doesn’t contain HFCS. Now I’m no fan of HFCS, but your body reacts the same way to that as a million other sugars, even natural sugars. But the difference between naturally occurring sugar in fruit and sugar in a soda is that the fruit has the digestive benefit of natural fiber. Most people don’t get a sugar rush from eating apples, and they get full on apples before they could eat enough to produce that effect. Getting a sugar rush from something like soda also means that your pancreas produces insulin to deal with it, which blocks the receptors that tell your brain you are full. Which is why you can often mindlessly eat junk food way past the point of excess without ever thinking you are full. All of the metabolic diseases that Americans are sick with – diabetes, heart disease, cancer, strokes – have links to excess sugar consumption. And the average American has no idea how much they are consuming, because sugar doesn’t just appear in things like cookies and soda that we know are “sweet.” Virtually every processed food has added sugars – even ones that we would traditionally associate with health, like yogurt. The film also touches a lot on the impact of this sugar intake on children, and how it’s particularly harmful to them because it sets them up for a lifetime of trouble. And we don’t do them any favors by marketing the food specifically to them (which the industry actually claims they don’t do). Yet somehow, 50% of schools in the U.S. serve fast food directly from restaurants. There are actually Pizza Huts in schools. Speaking of industry, when the World Health Organization released a report that sugar was the primary culprit for the “obesity epidemic” and recommended that no more than 10% of daily calories come from sugar, the U.S. Health and Human Services lobbied the WHO to take that information out of the report, and threatened to withhold the U.S. contribution to the WHO. The WHO caved, took it out of the report, and the U.S. extorted the WHO out of making a recommendation in the interest of public health. Government for the people, indeed. Fed Up has much more information on all of these areas I’ve touched on, and the cinematography is really engaging and well done. Many different types of experts are interviewed, and virtually every possible industry company was asked to participate and declined. I’d definitely recommend that people give it 90 minutes of their time – particularly if you struggle with sugar (or if you have kids that eat a lot of processed foods). So then why are all the kids interviewed in the film severely overweight? Why not interview a “skinny fat” person – a kid who lives on nothing but sugar and is on their way to diabetes, but they’re skinny? Because it’s a lot easier to stigmatize and shame fat people than it is to convince the public that skinny people are just as unhealthy. One poor 12 year old girl who was interviewed just kept crying. They used her shame to make a point. Why not interview a 12 year old girl who has significant behavioral issues that result from being hyped on sugar constantly? Because we don’t really care how healthy our kids are as long as they are not fat. No individual parent would say that, but collectively, it’s true. So while the film seeks to tell people that fat people aren’t responsible for their own “condition” because they have no idea what their diet products are doing to their bodies, I feel like it’s a hollow message, since it’s directed at only a portion of the people who need to hear it – the ones we don’t like to see because their bodies bother our sensibilities. As a nation, we want the government to protect our public health. Look at the outcry over Ebola and the CDC handling of it. But diabetes is going to kill many more people, including children, than Ebola ever will in the United States. But we don’t mind that our government panders to industry and its wealth instead of keeping us safe. If kids went to school and drank water that was contaminated, there would be a public outcry. But they go and eat Pizza Hut – being told by industry that it’s a vegetable – and we do nothing. So am I fed up? Yes. Have been for a long time. And I’m inclined to write another letter to legislators the next time health standards are up for debate. See the documentary no matter what you weigh and you will learn something. But especially consider it if you are a “normal” weight and think you’re immune to health problems from your diet. Because you aren’t. None of us are. 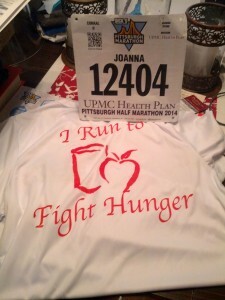 Because of garden season and marathon training, there hasn’t been too much on the blog in the last few months about agriculture or what’s going on in the world of food. But much has happened recently that’s worth mentioning. Perhaps the most positive Big Ag/Big Food news in awhile, Perdue Foods announced this month that they have removed antibiotics from their chicken hatcheries. They haven’t used antibiotics as a growth promoter since 2007, but this move now makes it so that 95% of their animals will not receive antibiotics in their lifetimes. The ones that do receive them to treat illness, etc. This move is important, because it addresses a large public health problem – the growing threat of antibiotic resistance. While Big Ag has a long way to go until they can manage humane animal husbandry, we can’t let perfect be the enemy of good. I applaud any move toward more sustainable, healthy agricultural practices. Tyson Foods, the largest meat producer in the U.S., has won anti-trust clearance from the Justice Department to purchase Hillshire (makers of Jimmy Dean sausage, Hillshire Farms and Ball Park hot dogs) for $7.7 billion. Yes, Tyson had to divest of its small hog division, making it an independent company until a buyer comes along, in order for the merger to gain approval. It boggles my mind that the Justice Department just opens the gates wide for these kind of mergers, with no concern whatsoever for independent meat producers, which are now few and far between. Civil Eats says it best in this short piece. More reason for me to continue avoiding meat of unknown origin as much as possible and to be more careful about it when I’m out. Ever eat Annie’s cheddar bunnies or mac and cheese? Well, General Mills just did, eating up Annie’s for $820 million. While not nearly as big as the Tyson/Hillshire merger, this deal represents Big Food’s insatiable appetite for organic and natural foods. Many independent companies over the years have been bought out by Big Food – General Mills already owns Kashi and Muir Glen. What it means for the quality of the products sold under that name or its sourcing of ingredients remains to be seen, but it’s still hard to not hum “Another One Bites the Dust” under my breath. On a different note, episodes of a new series on PBS called Food Forward are available to stream. The pilot episode won a James Beard award, and I’m going to be watching them over the next few weeks and hopefully writing about them. Check it out! It’s been awhile since I wrote about the kinds of food issues that get me hot under the collar, for lack of a better phrase. My time for reading up on current issues is severely limited in the summer, for a lot of reasons, but primarily the amount of time spent dealing with vegetables and also running like it’s a part time job in marathon training. This means that even though the FDA admits that the use of antibiotics in healthy animals to promote growth and weight gain contributes to antibiotic resistance in humans, they can’t do anything to stop producers and commercial livestock companies from using subtherapeutic drugs for healthy animals. They issue voluntary guidelines, which are about as effective as me calling Cargill’s customer service department and asking them to stop using antibiotics in healthy animals. Leading health organizations from across the nation and the world – leading organizations and not just wacky health food hippies – have spoken out against the use of antibiotics in livestock. To name a few – the World Health Organization (WHO), Centers for Disease Control and Prevention, American Medical Association, American Society for Microbiology, American Academy of Pediatrics. This isn’t fringe science. There’s no real debate in the scientific community that this is a major public health problem. We are running out of antibiotics that are effective in treating many serious infections, and it will change the face of modern medicine if we can no longer stop common infections. But our own government organizations – the ones that are tasked with protecting the health of Americans – won’t stand up to industry and force them to reduce and eventually eliminate their reliance on subtherapeutic antibiotics. None of us want to revisit the world of our ancestors, where a scratch could easily kill you. So what do you do? Beyond making public comments when they are open and supporting legislation that would push for stricter regulations? Stop eating meat that comes from animals raised with antibiotics. I realize that I’m blessed to be able to buy meat from local farmers who do not use subtherapeutic antibiotics in their feed. But I can tell you right now that if tomorrow, my sources were no longer there, I’d give up meat altogether. More and more suppliers are producing meat that’s antibiotic free, and prices are coming down as demand begins to grow. If you do one thing to change your diet to support health as well as a better food supply – do this. Save antibiotics for when you have a real infection – and not just when you’re having dinner. This is a bit of a soap box post. Fair warning. I’ve talked before about online petitions and their effectiveness, as well as the hype over the “yoga mat bread” debacle. These things are all tied to what I call food alarmism. And it drives me nuts. To me, food alarmism is taking a concept related to food (particularly health food) and then blowing it way out of proportion and abandoning all reason, just to advance your agenda or philosophical position (and in some cases, a business interest). It’s often done in the name of advocacy – framed as public health crusaders trying to save the American people from themselves. I used to be on the anti-chemical bandwagon pretty hard for awhile, but the more I read, the more I realize there are a lot of harmless chemicals out there and a few that actually ARE health hazards. So you’ve got to find out what a ‘chemical’ actually is, how it’s used, what research is out there about its safety, etc. before you decide it’s poison. That isn’t to say we shouldn’t reduce our exposure to chemicals that have been linked with health hazards. But be smart about it. #3 – Hype is hype – whether it comes from Monsanto or a food blogger. Many people are in the business of getting people whooped up about very small issues. This is a good thing for companies and individuals who want people to be distracted from the larger picture (public health, access to healthy, whole foods for all people, the fight against hunger for starters) by starting crusades on the small stuff. What if all the energy spent on getting Budweiser to tell us what’s in their beer was spent trying to get access to fresh produce for hungry people? Which brings me to my next point. #4 – There are bigger fish to fry. The way I see it, there are really huge issues that we need to address as a nation that relate to our food supply. Namely, making sure everyone gets enough. And that they get enough actual, healthy food. Those of us who consider ourselves foodies (with all the good and bad that term carries) need to understand that the fact that we can even make the food choices we do is a privilege that not all of our fellow citizens have. Besides the availability of food in general, we have a really big and rapidly growing problem with antibiotic resistance. And it’s not just food bloggers or animal rights activists who think that. The Centers for Disease Control has made it clear that the indiscriminate use of antibiotics in livestock has contributed greatly to antibiotic resistant bacteria. Even the FDA acknowledges that it’s a problem (and they basically don’t acknowledge anything as a problem). So if we want to get behind something that can really make a difference in public health (not to mention animal welfare, but that’s another story), we should rally behind removing non-therapeutic antibiotics from our livestock. Rally behind the piles of scientific evidence that we are one major antibiotic resistant epidemic away from a true public health nightmare. So while Vani Hari (a.k.a. Food Babe, She of Many Petitions) rallies her army of disciples to expose the chemicals in a Budweiser, I’ll choose to lend my voice to issues that might actually end up helping people – and are backed up by science, reason and common sense. While I was perusing the documentaries on Netflix recently, I found a short one about the attempt to save an urban garden. It wasn’t spectacular as far as documentaries go, but the events it concerned made me want to find out more. In doing a little research, I realized a longer documentary was done on the events – a film that was nominated in 2009 for an Academy Award for best documentary. So I ordered it from our library and checked it out. The Garden is the story of an urban garden/farm that occupied 14 acres smack in the middle of South Central Los Angeles, an area that had been ravaged after the Rodney King riots in 1992. The farm had 350 plots, which provided food for families, most of which were low income. It was like an oasis of earth and growth surrounded by concrete and urban decay. The documentary goes into the history and timeline in more depth, but basically the city of Los Angeles decided to sell the land that the farm occupied in a back room deal for drastically less than fair market value to the owner who had lost the land to eminent domain laws 15 years before. The farmers had been on the land because the city let them – they had no formal agreement. The owner decided he didn’t want the farm on the land and tried to have them evicted. A legal fight ensued. I won’t tell you exactly what happened because the documentary tells it powerfully, but it wasn’t good. It was another tale of the rich and powerful using the government like puppets to advance their own desires, regardless of the needs of the community. It seems to me that governments should be doing anything they can to support groups who want to reclaim urban spaces that have been left to decay, particularly those that can be turned into gardens that feed people. I see a lot of rhetoric about low income families needing to “help themselves” – and this is a classic case of people who try to do just that and get thwarted by the roadblocks of power and money. The Garden left me wondering how willing I’d be to chain myself to a fence and be arrested if someone was trying to bulldoze the way I provided for my family. How much would I fight? Do we listen to those who do, or do we assume they are just disturbing the peace? This is a great documentary, especially for people who are interested in issues of economic justice and community activism, as well as urban agriculture. Definitely worth a watch, even if it leaves you unsettled (which is kind of the point anyway, right?). This week, U.S. Representative Mike Pompeo (Republican from Kansas) introduced legislation called the “Safe and Accurate Food Labeling Act.” I don’t think I’ve ever heard of a bill so mislabeled in my life, as what this bill would do is ensure that we never achieve safe and accurate food labeling. Opponents have dubbed this the DARK (Deny Americans the Right-to-Know) Act, and the hyperbole actually seems to fit here. The bill aims to override state efforts to label GMO foods, as several states have taken up that charge and introduced labeling legislation. Rep. Pompeo’s bill would prohibit any mandatory labeling of bioengineered foods. He claims that the “patchwork” of state GMO laws creates no standard and creates unnecessary fear on the part of consumers. And I agree with him on the first point – we do need a federal standard. But we need one based on science, which at the current moment means that we don’t know the long-term effects of GMO crops on health and the environment. So we need to be aware of where they are and how much we are consuming. If products aren’t labeled, the long-term effects can’t be assessed. Labels are like the informed consent portion of being part of a national experiment. People have a right to be afraid when we aren’t informed. We need to know. To me, this bill is evidence that the bioengineering companies know that consumer confidence is flagging and that their lack of transparency is an issue. So instead of changing their business practices or allowing the American people to decide what they want, they will pour their money into Congressional pockets to take the decision out of our hands and into the federal government. In the absence of any federal transparency legislation, state legislation is important. State legislation is where the voice of the American people gets to be heard more than lobbyist dollars and Big Ag. Yes, on the state level we also contend with lobbying and misinformation, but the vote comes to the people who are affected by it, instead of members of Congress who can be and are often easily swayed by corporate money. This bill really matters. Enough that I’m contacting my legislators, and I encourage you to do the same. Even if you have no issue with GMO foods being unlabeled, the fact that the government is trying to preempt your right to have that distinct voice be heard in a state-level vote is troubling. And right now it’s biotech corn that’s at the center of this debate. But if this legislation passes, what’s next? Biotech fish? That’s on the horizon. Maybe Farmed & Dangerous wasn’t so far off with its 8-winged chicken. So I’m sending the letter below to my federal legislators – and even some that are in my region, but not my specific area. It’s a modification of a letter that Just Label It, a national GMO labeling advocacy organization, put together. Feel free to use it and tweak or personalize it to let your legislators know that you want transparency and choice in our food supply. I am urging you to not co-sponsor the new legislation introduced by Rep. Pompeo (R-Kan) that would deny consumers a right to know about genetically engineered or biotech foods and allow companies to voluntarily label genetically engineered (GE) foods. Until independent, third-party science can truly verify the long-term health and environmental effects of GE foods, the American public deserves transparency. If bioengineering companies are to be allowed to expose the public to GE foods, which can pose risks on many levels, we have the right to informed consent. Rep. Pompeo’s bill would pre-empt states from taking any legislative efforts towards the labeling of GE foods and allow GE ingredients in products labeled as “natural.” It would also prevent the FDA from requiring GE labeling in the future. As one of the 93% of Americans who support GE labeling, I strongly oppose this legislation, and urge you to not sign on as a co-sponsor. I am asking that instead you support the GE Food-Right-to-Know Act (S.809/H.R. 1699) sponsored by Sen. Boxer (D-CA) and Rep. DeFazio (D-OR) that would require food manufacturers to clearly label any product that has been genetically engineered or contains GE ingredients. Studies have shown that the majority of Americans regardless of race, religion, class, or political party support GE labeling, a right that people in 64 nations around the world already have. Lack of labeling also complicates our exports, as more and more nations are refusing to import GMO foods. Russia is just the latest. Please endorse federal labeling of GE foods, and vote against any legislation that would bar the Food and Drug Administration, or the states, from mandating labeling of GE food. Do not support legislation that makes the American people, your constituents, the lab rats of corporate biotech. If you don’t know who your representatives are, you can find out here. Same with senators, here. I’m contacting my senators too, in case this bill makes it to them. We can’t expect legislators to know what we want them to do for us if we don’t tell them. Watching and reading the news and getting outraged isn’t going to do anything if you don’t push where it matters. Then we can hold our elected representatives accountable. Chipotle has been on the forefront of national restaurant chains in the movement toward more sustainable and humane agriculture practices. Their first foray into viral marketing was “Back to the Start,” a video with Willie Nelson singing that emphasizes the importance of not continuing on the path of industrial animal production. Next was “The Scarecrow,” which I talked about here. This one pushes its indictment of Big Ag even further (and also suggests that burritos are a good choice). 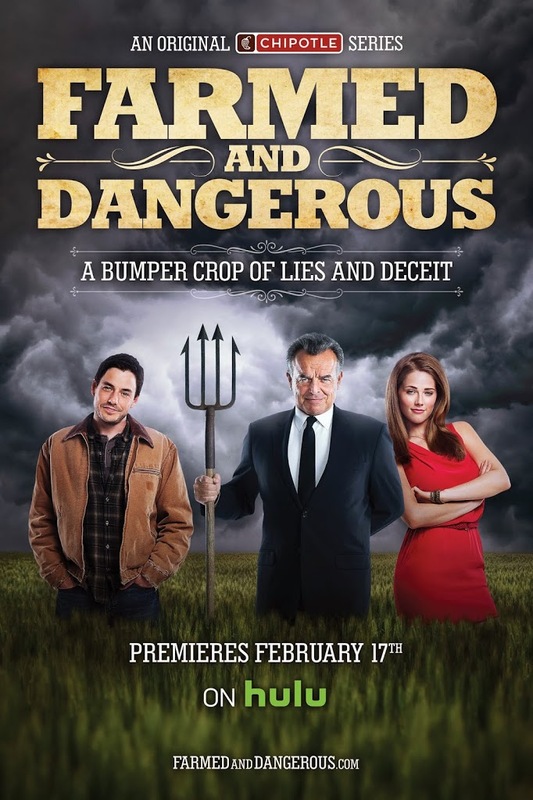 And now they’ve gone even further, with a four-part TV series available on Hulu Plus called Farmed & Dangerous. I waited until all four episodes were available to do my week free trial of Hulu Plus and watch. The series is centered around a PR firm called the Industrial Food Image Bureau (IFIB, hee hee) which has as its primary client a Big Ag company called Animoil (a stand-in for Monsanto, obviously) which wants to market a new product called Petro Pellet, which is pure petroleum. In the first episode, they realize that Petro Pellet makes cows explode. A group called the Sustainable Family Farming Association gets a copy of the video of this happening and it goes viral. The episodes that follow are about the relationship between the daughter of the head of IFIB, who also works there, Sophia, and the head of SFFA, Chip. Over time, Sophia comes to be sympathetic to Chip’s cause, but not before a lot of chaos ensues. It hits on all the big issues – sustainability, pesticide and herbicide resistance, GMOs, government subsidies, lobbying and government corruption, Ag-Gag laws, CAFOs (which they call MegaFarm, the Death Star for Cows). First, the good. I will always applaud Chipotle for trying as a large national chain to bring these issues into the forefront of the public’s awareness and concern. They have at the very least opened up a lot of conversation. And Farmed & Dangerous in some spots is genuinely funny (particularly due to Buck, the head of IFIB). 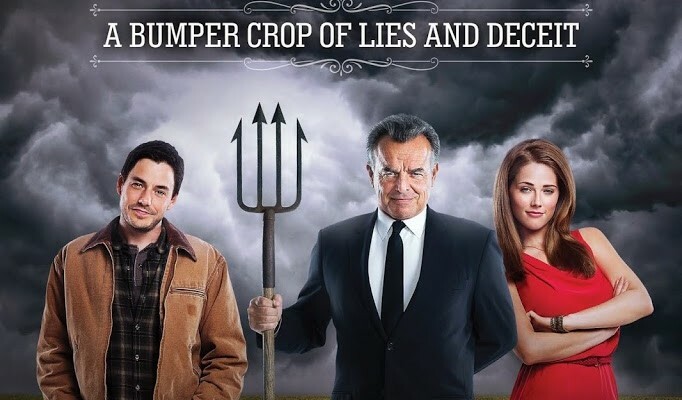 While critics have suggested that the series really takes aim at farmers with a broad brush and paints them in a bad light, I actually didn’t think the series was much about farmers at all. I think who it really skewered was PR firms and industry front-groups that blindly promote Big Ag to the point of absurdity. In one particularly interesting segment, Chip is on a morning show and points out how alternate realities exist for Big Ag depending on what they want at a given moment. Sometimes Big Ag wants GMOs to be seen as unique, which is why they voraciously protect their patents. But they argue that when it comes to public health, GMOs aren’t unique – they aren’t any different than the regular corn. Which is why they oppose labeling on consumer products. In the case of the viral video (a stand-in for the types of CAFO whistleblower videos that Ag-Gag laws aim to curtail), they claim that the videos are fabricated or exaggerated, but then claim that they own the video because it was shot on their property. If it’s false, why are you claiming it as your own? So I think that exposing the crap that comes out of the PR firms and departments protecting industrial agriculture is something that’s sorely needed. Front groups often have deceptively friendly names, which make consumers think they are advocating on behalf of us, when they are really advocating and lobbying for their big clients. But. Here’s my issue with Farmed & Dangerous. With this series, I feel like Chipotle is really starting to mislead by obscuring facts and using hyperbole and satire in a subject that already has a lot of misinformation and passion floating around. When Jon Stewart uses satire to bring communicate news, he typically brings it with a lot of video clips and facts that support his points. He may go over the top, but the message is there as well as the proof. This series doesn’t do that. For example, Chipotle wants to position itself as a sustainability advocate, and this film makes it seem like all farms that it sources its meat and other ingredients from are like Chip’s farm – idyllic and full of pasture and sunlight. In reality, that’s not the case. Chipotle sources a lot of meat and often substitutes conventional products when they run out of the “better” choices. If you were really committed to better practices, you’d just not sell the option that you couldn’t properly source. But that would eat into their profits and would be unpredictable, and the customers want their chicken when they want it. I would be more compelled to believe they care about humane animal treatment if they stopped selling conventional products at all. There are animals who are not given hormones or antibiotics that are still raised in confinement operations and are not out frolicking in fields for most of their lives like Chip’s cow friend. I can see farmers’ points of criticism that the series seems to pit big farms against small farms, making it seem like all big farms are evil and all small farms are virtuous. In reality, it’s not really the size that determines the quality of practices. You can’t lump in broad categories like that when it’s really the underlying system of agriculture in this country that is flawed. It’s not as easy as good guys and bad guys when you dig below the surface. What we need is less control over the food system by a select few corporations, not to be lecturing farmers on what they need to do. And Chipotle needs to stop equating sustainability with small, family farms and throwing that word around. Not all small farms are “sustainable” – a word which is really hard to define. Not giving your cows hormones doesn’t mean that your operation is sustainable. And not all family farms are small. Some mid-size and large farms have been in families for generations. Chipotle isn’t knocking on the doors of tiny family farms in my area asking them to provide their tomatoes and peppers. Sustainability is a buzzword that you use to mislead unless you have facts to back up your practices. Using compostable plates isn’t enough. And I don’t even know that they do that. In all, I didn’t really think Farmed & Dangerous was effective satire. (They need to take a lesson from Jon Stewart on that one.) If they extended the series and added to it, I would be unlikely to watch. Chipotle needs to focus its efforts on making its business live up to its marketing, instead of marketing a business that doesn’t actually exist in reality.